This raga derives its name from the two words “Amrit” and Varshini”. It means one which showers “amrit” or the elixir of immortality. A particular incident, which occurred in connection with this raga, may be of interest to the reader. During his visit to Ettayapuram, a small village in Tamilnadu, the great composer Muthuswamy Dikshithar (late 18th century and early 19th century) was shocked to see people suffering owing to a draought. He looked up at the sky and sang in praise of the goddess Devi in the raga Amruthavarshini. The moment he uttered the words “salilam varshaya, varshaya” there was a heavy downpour and the place was flooded. This raga is considered as the Raga of Rain.It is believed that Muthuswami Deekshithar sung this Raga and made rain come,in Ettayapuram, Tamil Nadu. Not many compositions are available in this Raga. Amritavarshini is a rāgam in Carnatic music (musical scale of South Indian classical music). It is an audava rāgam (or owdava rāgam, meaning pentatonic scale). It is a janya rāgam (derived scale), as it does not have all the seven swaras (musical notes). Amritavarshini is considered a janya rāgam of Chitrambari, the 66th Melakarta rāgam, though it can be derived from other melakarta rāgams, Kalyani, Gamanashrama or Vishwambari, by dropping both rishabham and dhaivatam. Chitti Babu (1936-1996) was one of the most famous Veena artistes of India, who had carved his place amongst the all-time greats who played that instrument. A man who became a Legend in his own Lifetime, his name was synonymous with the instrument “Veena”, and he was and is still known in the Carnatic music world, quite simply as “Veena” Chitti Babu. While continuing with the principles of his Guru’s pioneering school – the Emani “Bani” (tradition/style), Chitti Babu, created and evolved a distinctive style and identity, entirely his own. The exquisite tonal quality and versatility that have been his magical hallmarks of his style of playing the Veena, saw him produce sounds as varied as the majestic Vedic Hymns or as delicate as the Cuckoo’s voice or even play many western-music based compositions of his own. He was known to reproduce the songs and compositions in an almost vocal like tonal quality on his Veena, and was also known to evoke deeply emotional and appreciative responses from his audiences. His music could impress the connoisseurs and invoke the interest and curiosity of the youngsters as well, that always ensured that his concerts were a big draw in terms of audience. He had traveled extensively across India and also to USA, Europe, Australia, Middle East and Asia Pacific and had performed to jam packed auditoriums for nearly 5 decades, transcending many barriers and taking his music and along with it, a part of India’s rich cultural heritage across the world. Groomed in the Emani tradition, by his Guru, Emani Sankara Sastry, Chitti Babu soon created and evolved a style that was distinctly his own. Whether it was in the nature of his plucking the strings or the varied patterns that he could evoke on the stringed instrument, he had a “unique touch” that was his hallmark, making fans instantly recognize it as his very own special gift to the world. Stressing on melody and Bhava (emotion) above all else, Chitti Babu aimed to touch people’s hearts through a style of playing that never failed to strike its mark. Like other instrumentalists, he too never enjoyed the advantage of moving an audience through the power of the lyrics of the song. He had to win them over with nothing but the sheer melodious rendering of the song and raga. He believed in playing in such a manner as to convey the true meaning and essence of the song and its Bhava (emotion). Whether he played a composition extolling the virtues of love, compassion, tranquility, heroism, sadness, or Bhakti (Devotion), the most telling and fulfilling aspects of his performances were visible when fans used to spontaneously come and compliment/embrace him for the way in which his music touched them deeply. Chitti Babu was his nick name at home, which came to stay eventually, after his father formally changed it to be so. He was a child prodigy who started playing Veena at the tender age of 5. He had a providential beginning, when at that tender age, he corrected his father playing the Veena and the stunned father spontaneously decided to let go of his own practice and chose to focus on getting his son started on the Veena and nurture the child’s inherently prodigious talent. He had his basic training very early from Shri. Pandravada Upmakaya and Shri. Eyyuni Appalacharyulu, both whom recognized the boy’s genius very early, and strongly urged Ranga Rao to encourage his son in pursuing the art. He gave his first performance at the age of 12. In 1948, they moved to Madras (now Chennai) primarily because they got the opportunity for Chitti Babu to act in a Telugu movie “Laila- Majnu” as a child artiste. However, Chitti Babu even as a child of 12, was very focused and determined on becoming a musician, after the movie assignment. 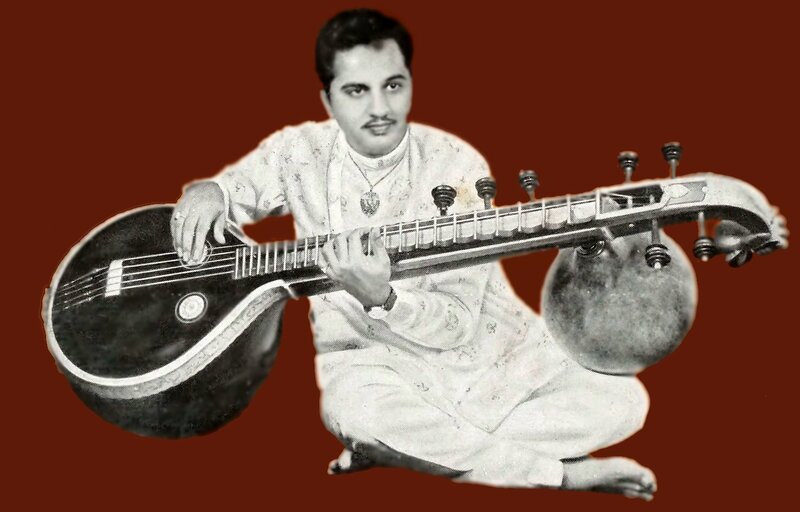 He was inspired by the original style of another renowned Veena maestro Emani Sankara Sastry (1922-1987) and was under his tutelage, learning all the nuances and honing his skills. Like any struggling artiste of that era, it was also difficult for him to get the first major breaks as a performing artiste and more so as a teenager. So, he had a significant stint in film music from 1948-1962, when he worked in the South Indian Film Industry as a recording artiste, playing Veena for background scores in movie soundtracks under the batons of many eminent music directors of the time. However, the burning ambition inside him to break away and establish himself as an independent, freelancing performing artiste made him declare at a very young age – “Veena is my Mission in Life”. Emani Sankara Sastry (1922-1987) was born in Draksharamam village of East Godavari district and he was the son of Emani Achuta Rama Sastry, himself a famed Vainika (Veena Artiste) of that era. Trained in the steepest and best of traditions by his father, Emani Sankara Sastry was an open-minded experimenter, and also evolved contemporary themes, to give Veena the element of modernity that it was perhaps lacking at the time. He graduated from Andhra University and moved to Madras (now chennai) and joined Gemini Studios as a Music director for almost a decade. In 1959, he joined All India Radio (AIR) as producer of Music and also rose to the position of Director and composer of the National Orchestra there. Chitti Babu is his most famous disciple and it was a celebrated “Guru-Shishya (Disciple)” that both cherished a lot through out their lifetimes. Shortly before passing away in December of 1987, one of the last functions that Emani Sankara Sastry attended was in Guntur, where in he was felicitated by his most prodigious disciple Chitti Babu at a public function in his honor. It was perhaps a providential last tribute to a very accomplished life.